Creator groups across Europe and in Canada are welcoming the European Parliament’s vote in favour of the Copyright Directive, which passed last Wednesday with a strong majority of 438 in favour and 226 opposed. Creator advocacy played a crucial role in ensuring the positive results. The #MakeInternetFair campaign issued a petition that was signed by more than 50,000 creators from across Europe, including artists, authors, and other creators. The campaign highlighted the “transfer of value” problem – where the value of cultural and creative works is completely retained by user uploaded content services, such as YouTube, instead of rewarding the creators. The Canadian government has the opportunity to stand up for creators in the current review of the Copyright Act. Focus On Creators is a coalition of Canadian musicians, authors, songwriters, and other members of the creative class, which was created to bring focus to the artists’ perspective in light of some major federal cultural policy activities. So far, more than 3,700 Canadian creators have signed our joint letter to Minister of Canadian Heritage Pablo Rodriguez, which urges him to put creators at the heart of future policy. The letter acknowledges that today, Canadians are consuming more digital content than ever before, and creators have led the shift – they have digitized their work, mastered the Internet, and worked to adapt to this new digital age. Yet while some of us have found success, too many others are being squeezed out of the marketplace. The middle-class artist is being eliminated from the Canadian economy and full-time creativity is becoming a thing of the past. Many of the laws and regulations that should allow creators to monetize their works and make a living are outdated. As a result, creators are not being adequately remunerated for the digital monetization of their work. Without urgent attention from government, thousands of Canadian creators will not be able to tell their uniquely Canadian stories – much less earn a reasonable living doing so. To read the letter and add your name, visit https://focusoncreators.ca/ourletter/. On December 14, the Government of Canada announced that the Standing Committee on Industry will undertake the statutory review of the Copyright Act. Creators have been eagerly awaiting this review, as it presents a vital opportunity for the government to stand up for Canadian creators, and ensure that they receive fair remuneration for their work in the evolving digital landscape. We look forward to engaging with the Canadian government and working towards a meaningful #Copyright Act reform that protects Canadian music creators and the ecosystem that supports them. Importantly, amid the excitement and optimism there is also a sense of urgency to improve the current situation for creators. Many who congratulated Minister Bains and Minister Joly on the announcement also stressed the need for a full and meaningful review of the Act. More than 3,600 Canadian creators have signed our letter to Minister Joly. Now that the review has officially been announced, it is more important than ever to urge the Government of Canada to put creators at the heart of future policy. If you’re a Canadian creator and haven’t yet signed our letter, please read it and sign if you agree. As the review process unfolds, Focus On Creators will share new developments and any opportunities for Canadian creators to make their voices heard. 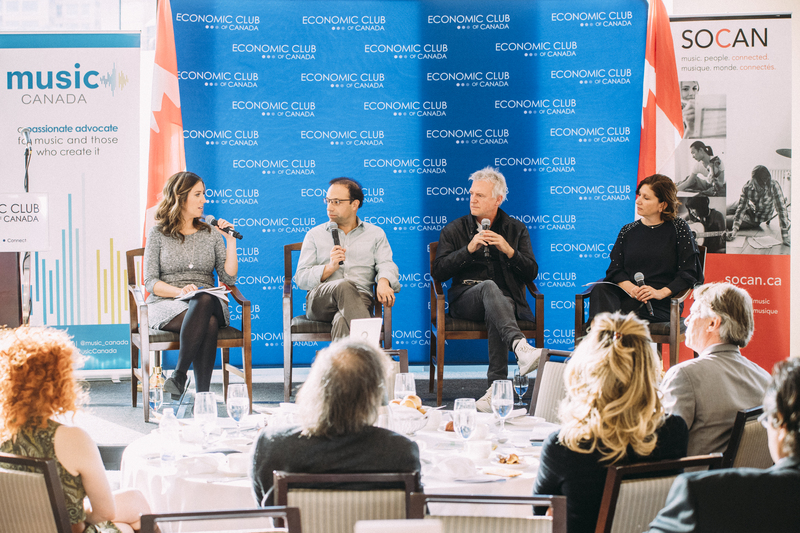 On Nov. 22 in Ottawa, a panel of representatives from different cultural industries shared their perspective on how the digital marketplace has affected their industries and individual careers. The panel followed a powerful keynote by Miranda Mulholland, an artist and entrepreneur who highlighted the challenges for artists working in today’s digital age and proposed solutions to help ameliorate the current situation in the music ecosystem. Among these challenges is the Value Gap, defined as the significant disparity between the value of creative content that is accessed and enjoyed by consumers, and the revenues that are returned to the people and businesses who create it. A selection of quotes from the panel are included below, with Ms. Kapelos’ questions in bold. What does the Value Gap mean to you? Do you think the idea of an artist who can pursue their craft full-time is now long gone? Where does government fit in in all this? You heard Miranda talk about the Copyright Act Review … what are some tangible things that you hope to see come out of that review? What is your level of optimism? Video of the keynote and panel is now available online, and embedded below. We’re pleased to announce that the Canadian Council of Music Industry Associations (CCMIA) has formally joined the Focus On Creators coalition as a supporting partner! The CCMIA represents provincial and territorial music industry associations in Canada, including Alberta Music, Manitoba Music, Music and Film in Motion, Music BC, Music Nova Scotia, Music NWT, Music PEI, Music Yukon, Music/Musique NB, MusicNL, MusicOntario, and SaskMusic. Between its member organizations, the CCMIA represents nearly 8,000 music industry professionals across Canada, including artists, managers, publicists, agents, educators, promoters and other music industry entrepreneurs. Nearly 1,100 Canadian musicians, authors, songwriters, composers, music producers, poets, playwrights, film composers, actors, directors, and other members of the creative class have signed a joint letter addressed to the Honourable Mélanie Joly, Minister of Canadian Heritage, urging the government to put Canada’s creators at the heart of our cultural policy. Canadians are consuming more digital content than ever before, and creators have led the shift – they have digitized their work, mastered the Internet, and become their own social media directors. Yet the laws and regulations that allow creators to monetize their works to make a living are now out of date. Without urgent attention from government, thousands of Canadian creators will not be able to tell their uniquely Canadian stories. “In an ever-changing digital climate that is working against creators to financially exist, it has never been more important for Canada to be leaders in copyright reform to not only save artists, but the voice of Canada,” says Royal Wood, professional musician. In light of some major federal cultural policy activities, including the Canadian Content in a Digital World consultations, and the upcoming Copyright Act review in 2017, the Focus On Creators coalition was formed to bring focus to the artists’ perspective. The initiative is supported by Canadian creative industry associations including Music Canada, the Canadian Independent Music Association (CIMA), the Writers’ Union of Canada, the League of Canadian Poets, the Canadian Music Publishers Association, the Playwrights Guild of Canada and the Canadian Country Music Association. “The digital shift has brought a wealth of opportunity to Canada’s writers and readers, but that opportunity is accompanied by serious economic challenges that must be addressed with sensitive, nuanced policy in order to maintain a distinct Canadian cultural identity and to ensure that Canadians continue to have access to Canadian stories,” says John Degen, author and Executive Director of The Writers’ Union of Canada. The initial list of creators grew to nearly 1,100 individuals in a short time, but is expected to increase now that the initiative is launched. Canadian creators are encouraged to join Alanis Morissette, Brett Kissel, Blue Rodeo, Gord Downie, Gordon Lightfoot, Grimes, Metric, The Sheepdogs, Marie Claire Blais, Rudy Wiebe, Guy Gavriel Kay, Sharon Pollock, Daniel David Moses, Mary Vingoe, Garth Richardson, Gary Barwin, Alice Major, Maureen Hynes and many more Canadian creators in adding their names to the letter at FocusOnCreators.ca. Please help send this important message to policymakers in Ottawa.